PLAY BALL! 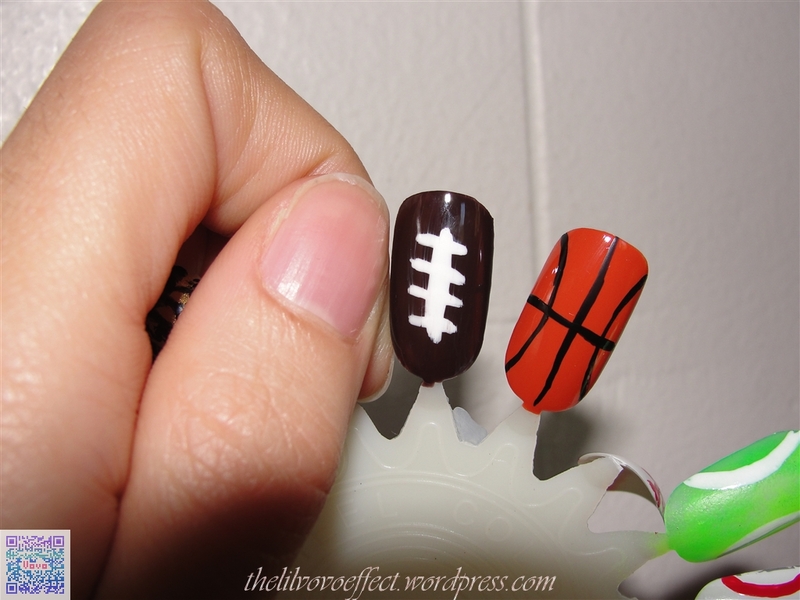 For those of you who are sports enthusiast here are some super fun sporty nails. For any of the designs you could either do all fingers with the one ball of your choice ( or multiple balls ) or a fun alternative could be paint your thumb and ring finger in the ball of your choice and doing all others with a complimenting french tip. For example if you like basketball, do the thumb and ring finger as the ball and all other with an orange tip maybe even go over the “smile” line with a black stripper to outline. Another idea would be to do all the other tips with your favorite sports team’s colors! Okay now for the breakdown of these designs. Basecoat all nails! The baseball can be done two ways. After putting down your white polish you can either take a detail brush and go in a zig-zag like motion to make it appear threaded or just do the two lines curving in and then out again with a red stripper. If you attempt the zig-zag motion and you’re not used to doing detailed work, practice on paper until you’ve got a nice flow going. Also, if you don’t have a detail brush just try a toothpick. Finish with a top coat. The tennis ball was very fun to make. I used a cosmetic sponge to sponge on the electric green. After that layer dries but still a little tacky I used the sponge again to sponge on a light layer of a very electric yellow (reminds me of a highlighter). I chose to sponge it so that it gives it more of a texturized look and feel. After those dry use a white stripper to make your tennis ball seams. The same as the baseball, it’s just two lines curving in-out-in. These are very easy, just go slower if you’re not too confident in your abilities. I didn’t finish with a top coat so that it has a fuzzy tennis ball like look. For the basketball use a bold dusky orange. You may need 2-3 coats depending on the opaqueness of your polish. You could also do your second coat texturized like the tennis ball with a cosmetic sponge. I haven’t tried this method for the basketball, but it might look good. After you coats are dry add the curving in-out-in lines and then 2 intersecting lines to finish the look. Finish with a top coat. So for the football paint you nail all brown 2-3 coats. After it dries use a white stripper to make one line down the middle and then some intersecting lines for the threads. Finish with a top coat. As for top coats instead of a glossy one, you could also use a matte top coat to make them seem a little realistic. If you do use a matte top coat for the tennis ball I suggest doing this before the white lines, but it’s not a rule and it’s up to you. I suggest this so that the line are glossy over top the “fuzzy” ball. So as always you do not need the exact same brands that I use. Since I did these designs on my nail wheel, I didn’t use a base or top coat. Normally if I was sporting this (XD) on my own nail I would use OPI Nail Envy for my base coat and either my Seche Vite Fast Drying Top Coat or my matte top coat Hard Candy “Matte-ly In Love”. After a long break (sorry) I hope you’re all ready for some more fun nail art designs! I’ve been doing a large haul this month that I will share sometime this week and it will most likely be a video ( maybe. I’m camera shy) . If there is a design you haven’t seen anywhere or you’d like to see my own spin on a design that has been done before just leave a comment telling me what it is! I Hope you’re all enjoying your fall, it really feels like it here in Montana (except for the past few above average days XD ).